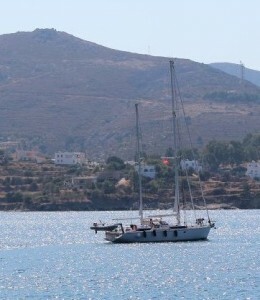 We arrived in Kalamaki marina after the trip from La Rochelle . I had to stay for a few days in Athens for family reasons and to put also the new Novuarinia 325 rib with the 20 Hp Yamaha engine. This was much more difficult as I thought. 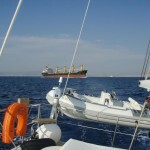 The dinghy had not suitable hoisting points for the davits and we had to improvise and find a way to hang the dinghy on the Amel boat and to be stable enough for the rough weather we were going to face in the Aegean with the meltemi in full force. It took me 7 days to finish the job without being sure about the result. 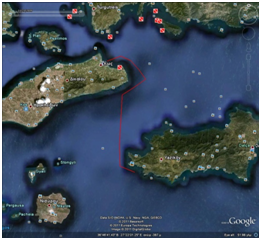 We started sailing with a few friends on a Thursday, July 14, with a weather forecast for heavy winds in the Aegean, but as we are used to that we only had to find out how the new boat is behaving in such conditions. 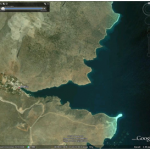 Captains Commentary:Our first stop was Tzia and we moored in Vourkari. In previous logs you can find a lot of pictures and information. 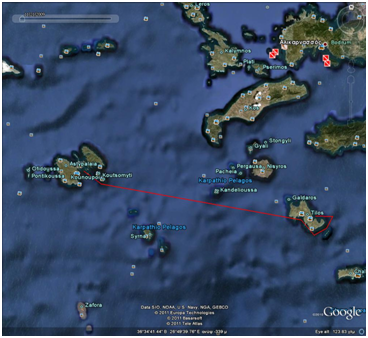 After Tzia we sailed to Loutro in Kithnos and decided to moor in the nearby bay and test the new dinghy. That was not a good option, as in the middle of the bay, in the bottom, there was a big chain, in order to make fast fishing boats, used in the past from the local fishermen. Our anchor felt on top of this big chain and we had to use the diving gear to take the anchor from the chain.After that we decided to anchor in the harbor of Loutro as the waves made the anchorage uncomfortable. We first visited the small harbor to see if there was space and it was relative empty due to the strong winds we entered and had an excellent place. 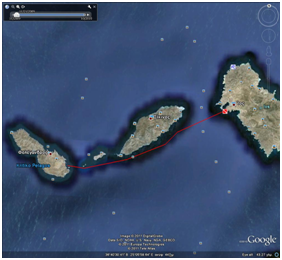 The next day we had strong wind sailing to Syros my second home port. I was glad to find a nice place with the ropes to the wind close to me was moored BEBE a SM2000 and I was happy to meet the owners who is an experienced Amel captain and we had the opportunity to discuss about Amel. 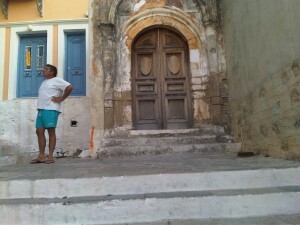 I stayed at Syros for a few days to see family. 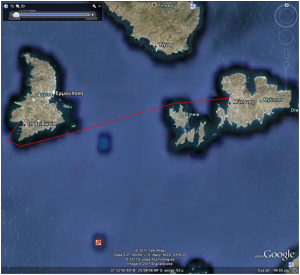 Captains Commentary: I stayed in Syros for a few days till my friend Anny came and we sailed together to Mykonos as my two daughters were there and I want to have a last lunch together and celebrate the birthday of my eldest daughter Elena.After lunch we sailed to the main harbor of Paros. In the evening we had our favorite singer Kyriaki Spanou and the violinist Oikonomidis singing and playing in the very nice church of Ag Anna and we were happy to hear them again after the last year performance in Kimolos. 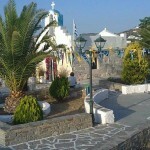 The place was very nice the weather calm and we enjoyed the panigyri very much. There, on the next day I met my friend Giorgos Gritzis who was eager to see the new boat. We had sailed the SM2000 from Hyeres to Greece and he wanted to see the improvements. And I met also my cousin Dimitris who was visiting Antiparos.The next day we sailed to Naousa a few miles to the north and stayed in the monastery bay in the Naousa bay and had an excellent dinner in Barbarossa close to the sea in the port of Naousa. Captains CommentaryThe next day the wind was very calm and we decided to sail to the Island of Folegandros, which has a very bad port and has a very uncomfortable swell with strong meltemi, but it seems that this port is the same uncomfortable with no wind. The harbor is unfinished and I believe it will stay like that for the next 20 years. The people of Folegandros do not care at all for the yachts as they rooms for rent anywhere.So after we moored, we went with the dinghy to explore the various beaches and visited the excellent Chora in the evening.The Chora is one of the prettiest in Cyclades and a big contradiction to the bad harbor. We had dinner in a village close by Ano Mera in a very windy place. I cannot imagine how the place is with strong North wind. We had a very traditional dinner rooster and makarounes, which are handmade pasta. The next day we had to leave as the water tank boat had to go along side to the small pier. By 10 o’clock every day all the boats have to leave, as huge M/T Maria moors. 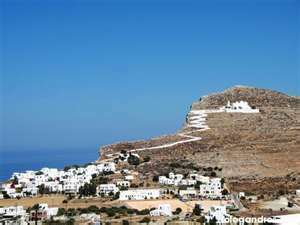 Folegandros is a beauty, but a very unfriendly place for yachts and I think it will take me another 10 years to go to Folegandros again. Captains CommentaryFrom there we motored to my favorite Island of Ios which has a very protective harbor and from there we made a lot of excursions to the nearby beaches and coves.We stayed 3 days in Ios, as we had good friends also visiting the island, and had the chance to explore the Chora. We walked down the picturesque stairs from Chora to the Port through traditional houses and gardens. We had excellent lunch at the Drakos tavern at Milopota beach, sophisticated dinner at Lord Byron and excellent bbq at Rigani by the port. 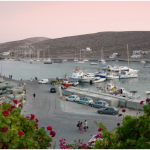 We did not have a chance to dine at Pythari, although our friends were very flattering about its cuisine.The harbor is very well organized with water and electricity and the protection is excellent although the ferries make some wakes entering the port. Notice the yellow buoy as there is a chain for mooring lines and you have either to take a mooring line or drop your anchor before the buoy. Last year our anchor was tangled and we had to call a diver to clear it as I did not like to dive in the polluted waters of the harbor.All around Ios are the most beautiful beaches of Cyclades.On Saturday, our last day at Ios we stayed on the anchor in the southern bay of Maganari with blue green waters all over. This one of my favorite bays but with strong meltemi is very pleasant to stay overnight as there are severe gusts from the mountains. 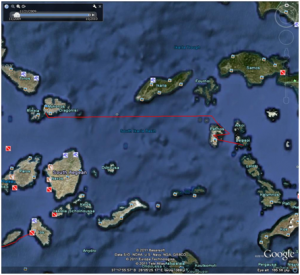 We cooked a gourmet dinner on board and went early to sleep, as we wanted to wake up early for our first crossing towards the Dodecanese.So early in the morning we decided to leave for Astypalaia the first Island of the Dodecanese 55 nm away. Captains CommentaryThe wind was only strong near the land and the Island has a nice new harbor with water and electricity and a very friendly environment with the low wind that was blowing. In case of strong meltemi I am sure that the harbor will be not so nice. With the dinghy we explored the bays and beaches and had nice walks in the town in the cliffs over the harbor. We had fun listening to strange stories from local people, nice drinks and a quiet dinner. 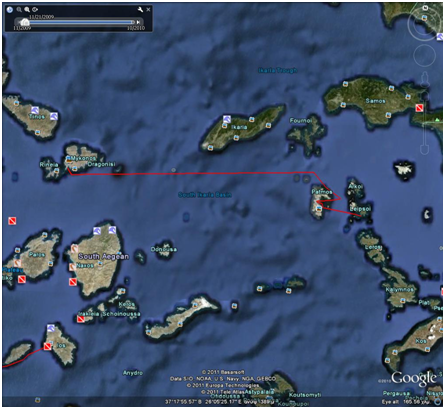 We started early in the morning for the next Island Tilos. 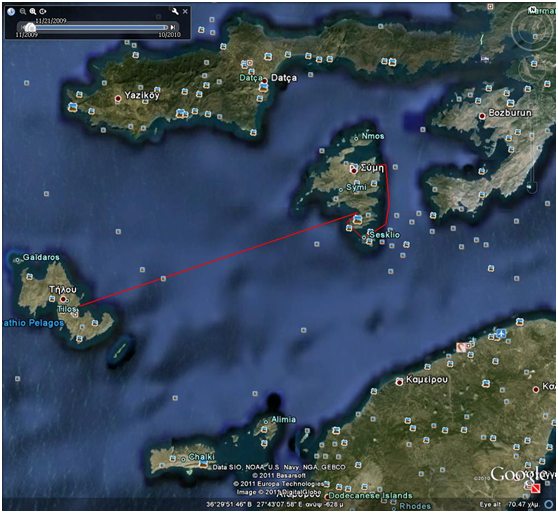 Captains Commentary It was 50 nm away till our first stop in Eristos bay in the west bay where we found some friends that have chartered a Turkish gullet and we had lunch together on board with some Turkish dishes. After lunch we left for the main harbor which provided better protection from the west wind and we had a difficult motoring around the island with heavy weather and big waves and we had the dinghy in the water as we faced a problem with the port davit it was going only down and not up. 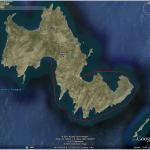 The route from Eristos bay to the main harbor was 12 nm with strong wind and big waves.The dinghy was suffering and I had to find the problem and repair it a sap as it was not possible to tow the dinghy in the big seas. 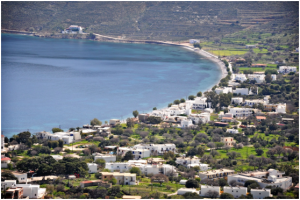 Tilos is a very nice quite place with a nice bay and a nice small marina that was well organized by a German woman who was extremely helpful.It is nice to find friendly people in such remote places. I found out the problem with the davit and we were very happy that we could again hoist the dinghy as it is not pleasant to tow it in the heavy seas especially going north against the prevailing wind. The problem was extremely simple to solve. The factory that assembled the davit forgot to solder the proximity switch at the end of the rope and the electronic understood that the circuit was closed due to the bad connection. I pulled the wire and it came out unsoldered. I was furious that such negligence can cause such a malfunction and create a big problem. 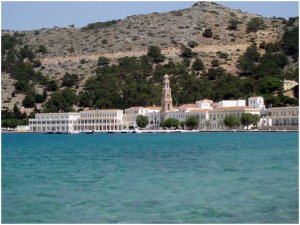 The next day we sailed to Symi to the Panormitis bay where a nice monastery is lying in a tranquil bay although the wind had picked up a lot and the exit from this bay was not very easy with the big waves. The monastery and the bay create special vibes. We stayed to relax and enjoy the place looking to all the day cruiser boat that arrived to leave people. 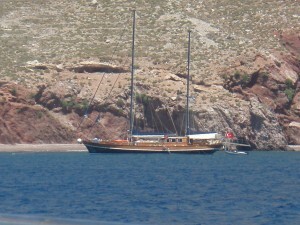 After lunch we sailed to Symi main harbor to find also our friends that were arriving from Tilos. the debris. We also fine dined at Pantelis and had excellent Italian dinner at Bella Napoli. 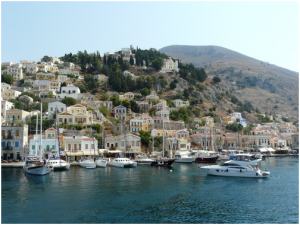 Symi is one of the nicest Islands of the Dodecanese full of life and nice traditional very well restored houses everywhere. 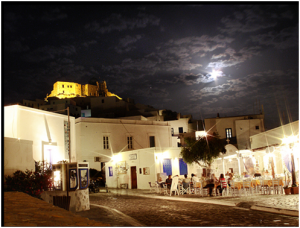 The Chora has a magnificent view. 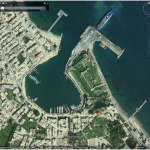 The harbor is well protected from the meltemi and sometime very hot but as there was the possibility to get electrical power you can use the a/c and cool down. 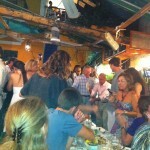 When in Symi, do not miss the Ag. 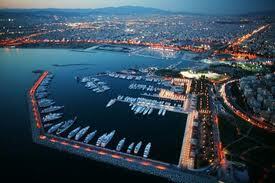 Marina beach, an excellent place to spend the day at. Captains Commentary: After 3 days in the wonderful Island of Symi we sailed to ancient Knidos. The wind had picked up a lot near the Turkish coast and unfortunately the direction was close to the wind and we could enjoy sailing in the last part. 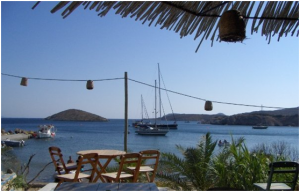 Knidos is a very nice bay with two harbors. We visited the ancient place and the ruins of the ancient Greek theater and in the night we had a wonderful dinner in the small restaurant with Yeni Raki and lobster. We always like the Turkish hospitality in a place with a lot of Greek history. It is remarkable how they built the town in such nice places. 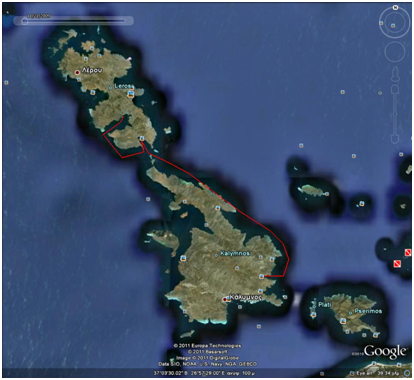 We had touched the eastern side of the Mediterranean sea so it was important that from Gibraltar in the west we arrived to Knidos in the east in the same season. Captains Commentary: After the nice evening in Turkey we sailed back to Greece and to Kos. The wind had picked up a lot with gusts over 35 knots apparent wind and heavy sea coming from the north east. We tried the staysail of our new Amel and it proved that it is a very useful sail going to windward in heavy weather conditions. 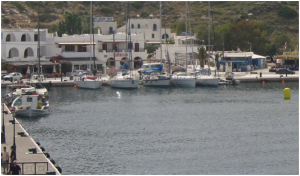 We wanted to stay in the Kos marina but as it was full we stayed in the main harbor in a very bad place in the entrance waiting for a better place inside the port to be better protected from the waves. 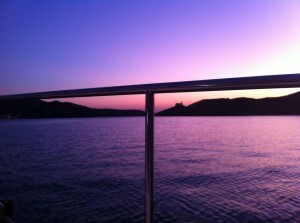 In the evening a lot of boats were leaving and we found a nice place to moor the boat. 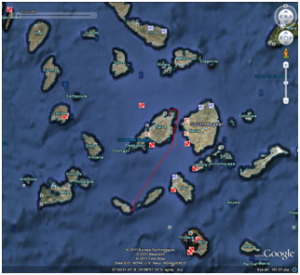 That was the fastest and most accurate mooring maneuvere we had ever done at the time. It is worth mentioning that Amel 54, even though wider than Super Maramu 2000, maneuvers much easier and elegantly. 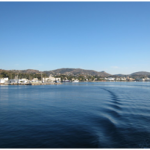 We stayed there for 2 days and had a nice time around Kos town. 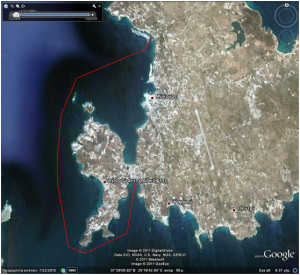 Kos was very busy with tourists and it was a big difference after the small islands we were sailing the last days. In Kos we have picked up the daughter of Anny who came by plane from Athens. 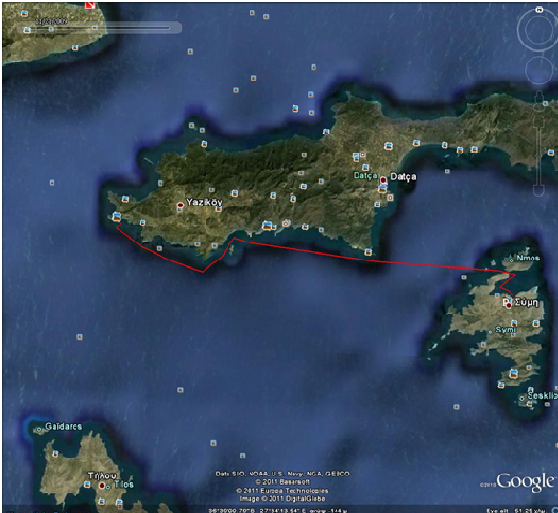 The next day they went by a ferry to Bodrum and I changed the engine oil after 240 engine hours. The next day early in the morning we left for Pserimos but the wind was picking up and the port in Pserimos was not comfortable enough and we decided to go to Vathy bay in Kalymnos. I do not know exactly why but I like this place. 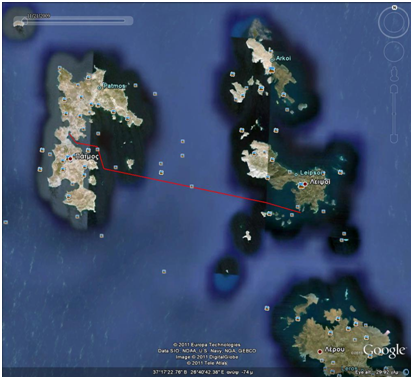 It is a very narrow bay like a fjord with a very small and well protected harbor although it was very crowded with boats a Turkish boat and the strong tavern owner helped us to find a place and moor the boat in very narrow place thanks to our powerful bow thruster. But after finishing the maneuver, which lasted a long time, the bow thruster stopped working and I was very angry as without it the boat is un-manouverable. We were lucky that is was a working day and the Amel after sale support informed me that this can happen they knew the source of the problem and they had to send me some new sensors to correct that problem. I had to take up the bow thuster and lower it again and this fixed the problem. I was glad for the support I got and the bow thruster worked again. The spare part was sent for me in Mykonos where I could pick them up. Excellent service, Amel. Dinner was an exceptionally well cooked and seasoned swordfish, calamari and fries at the local tavern by our mooring space. Italian as the main port of the Italian fleet due to its protection from the bad weather. It was a wise decision. 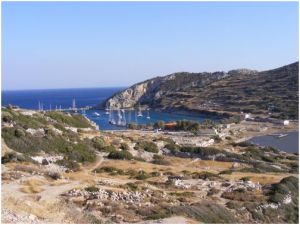 The place has very nice buildings erected by the Italians during their occupation of the island but they remain as wrecks and the place seems empty and neglected by the tourists. 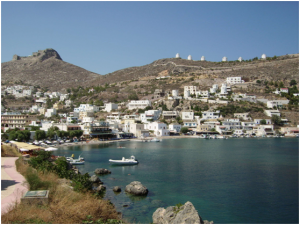 We enjoyed very much that we had also company by another cruiser boat that arrived with friends so we had a nice time going around for a few days in Leros and exploring the beaches, historical monuments and the tavernas. 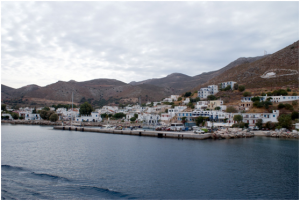 When the wind went down we decided to leave for Leipsoi a very small island but with wonderful beaches.We decided to use the southern route in order to have a look of the various places we have visited during our stay in Leros. We decided to stay overnight in a very nice bay in the southern part of Leipsoi and our friends decided to make barbeque on the beach and we had dinner all together on our boat. It was also full moon and the night in the bay was especially nice. 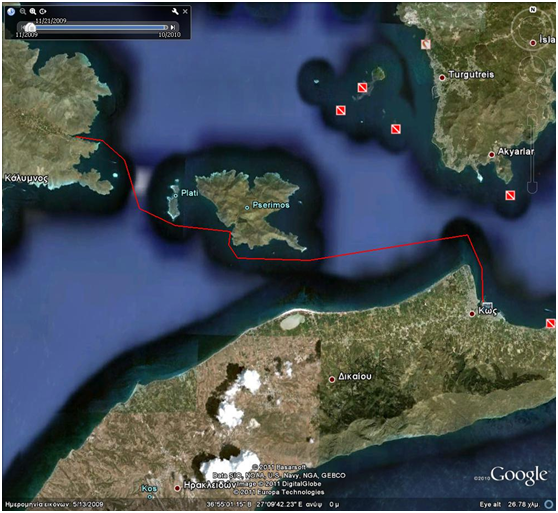 Unfortunately we were running out of time and we had to sail to Patmos without visiting all the other Islands around. 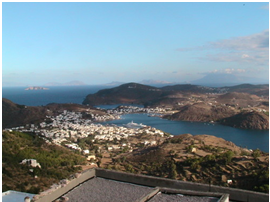 The next day we left for Patmos the holy Island of the Dodecanese as Ioannis has written here the Apocalypse. 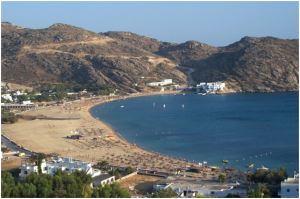 Patmos is one of the nicest Islands and in the bays are excellent beaches for day excursion which we visited with the dinghy. 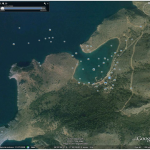 The harbor is very well protected but has no facilities at all no water no electricity, although it is very easy to make an installation of cables pillars and water supply pipes. It is a pity that the yachting infrastructure is so poor in such a nice island with so many boats visiting from all over the world. We stayed only one night in this beautiful Island but we promised to come again. 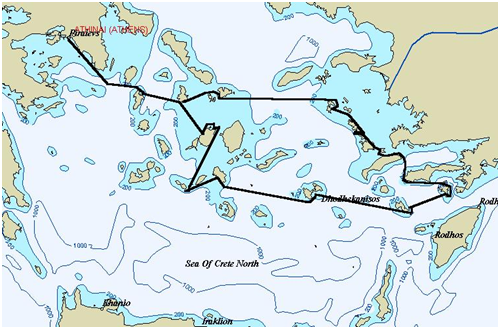 Captains Commentary: The weather forecast looked again ugly for the next days so we decided to make the crossing a sap in order to avoid bad weather during this passage in the Ikarion Sea. It was a wise decision mainly due to the good forecast that www.usgrib.comwebsite which we followed every day. 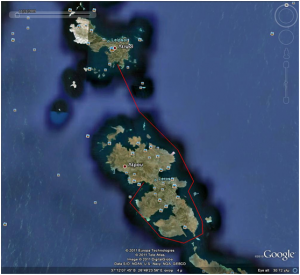 The first 50 nm we had variable wind from the north but the last 25 nm approaching Mykonos were sailing in over 30 Knots wind again with the staysail and heavy sea close to the Island it seems that this is the most windy place in Greece. Anny felt it was one of the most fascinating crossing we ever had.We arrived exhausted in Ornos and for the first time we had to anchor three times to make the anchor to hold: it was a nightmare. A friend of us arrived later with his sailing boat from Patmos and he described to us how strong and difficult it was the sailing for the last miles. 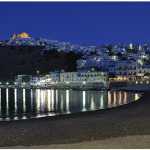 We had a nice dinner on the beach of Ornos and the next day Anny and her daughter had to leave for Athens by ferry.I decided to move the boat to the main Harbor of Mykonos with a friend of mine. A very bad decision as on the way to the harbor the seas were over 3 meters and the wind was blowing over 30 Knots against us. The distance was only 7 nm but I think that it took us forever. 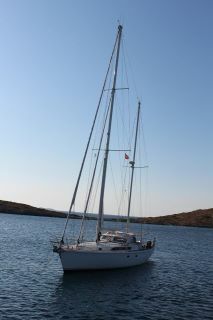 We arrived in the new marina with a gale and we succeeded to moor the boat which was extremely difficult. The marina is the worst place to be in such conditions. Windy waves and full of dust. No electricity no water. It is not at well lighted in the night and you have to walk in the dark. 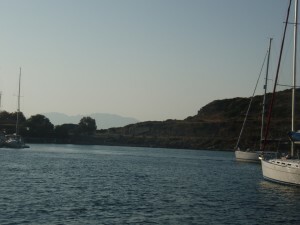 A friend arrived to help me bring the boat back to Athens and we stayed for one night in that horrible place. 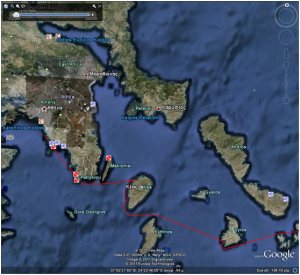 The next day early in the morning we decided to leave for Syros in my second home Port as the forecast was announcing gale force winds for the next days we decided to sail only to Syros and leave the boat there to weather the storm. 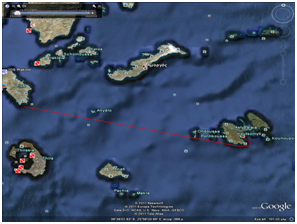 Captains Commentary:It was a relief to leave Mykonos and to sail back to Syros. The first miles were very difficult with strong wind over 30 knots and big waves after Rinia Island we had wonderful sailing with the wind coming from the back and we arrived very quickly to Finical my second home. 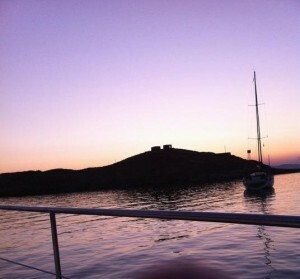 We find a nice place with the wind blowing from the back and we relaxed after the difficult time we had in Mykonos. 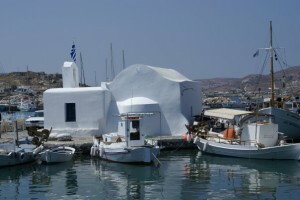 I promised to myself never to go in Mykonos by boat with a forecast like that. We left the boat there for 10 days as I had to be in Athens for family matters and we decided to go with Anny to bring the boat back and have some nice sailing after the meltemi stops. It was a good decision. The wind stopped only in the afternoon of the day we arrived. 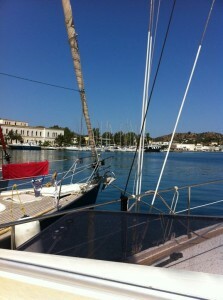 We cleaned the boat bought some supplies and had some nice time in Foinikas marina. I was also lucky that a friend of mine had a look at the boat so I felt 100% secure for the boat. Captains Commentary: The meltemi had stopped, after blowing hard over force 8 for 10 days. 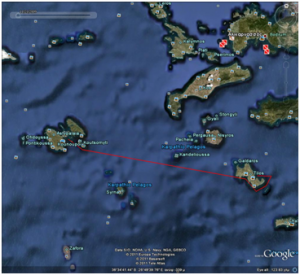 The day we left had excellent sailing to Kithnos, nice swimming in Koundouros a nice dinner and overnight stay in Vourkari. 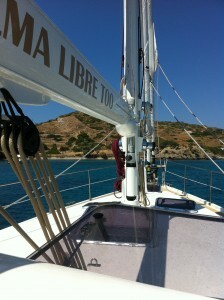 On the next day we motored to Floisvos marina the new home port of Alma Libre Too. We had a wonderful summer sailing in new places which we will always remember in the cold days of the winter to come.The voyages of Alma Libre Too continue…. Written by: admin on September 8, 2011. Last revised by: on October 6, 2011.